Perhaps, like most people, you are wondering how to light our bedrooms for better sleep? The lighting in your bedroom, as well as the way you control natural light, contribute to your sleep success. Too much light and you will be unable to sleep, not enough, and your bedroom may feel oppressive and uninviting. For the bedroom to be a peaceful escape from the outside world, you have to use design to manage all aspects of light. While some people love morning light streaming in a bedroom window, others prefer darkness until noon. In this case, sleeping in the dark wins. Sunlight consists largely of blue light. Special receptors in the eyes absorb blue light and send signals to the circadian region of the brain. Your circadian rhythms control your sleep-wake cycle. When it comes to your sleep, the bedroom needs to be as dark as possible so the body correctly follows its circadian rhythms. However, light pollution from a window can interfere with your sleep. Blackout curtains, heavy drapes, and blinds block and control light entering your bedroom at night. For those of you that still want a light and airy look, sheer curtains aren’t out of the question. They can be coupled with a second source of light controlling design (like blackout curtains) so you can keep light out when it’s time for bed. Of course, natural light isn’t the only source of light in the bedroom. How you use and manage artificial light can also affect your ability to sleep. Some light sources like high-efficiency light bulbs give off a bright blue light that’s similar enough to sunlight that it can suppress sleep hormones. In the bedroom, it’s best to use incandescent bulbs or high-efficiency bulbs designed to limit blue light exposure. Consider investing in an Alarm light. They simulate the dawn to wake you gradually. Lightwakes is the official light therapy product of the National Sleep Foundation; it wakes you up by simulating sunrise. The light slowly increases for 30 minutes before your alarm time to gradually prepare your body to wake up and feel more energetic at the start of your day. You’ll also need to consider other sources of artificial light in the bedroom. Electronics like televisions, smartphones, and iPads also emit blue light. While your best option is to keep them out of the bedroom altogether, that’s not always possible or desirable. If you can keep your television behind cupboard doors at night, it will be less of a temptation and any power indicator lights won’t interfere with your sleep. Nightstands with charging ports inside the drawers can help keep your electronics out of sight so they’re less likely to disrupt your sleep. Lastly, try to turn off your devices two to three hours before bed to prevent a delay in the onset of sleep. There are other design features you’ll need to keep in mind when improving your sleep quality. A mattress that’s firm enough to support your weight and preferred sleep style can prevent wakefulness as well as morning aches and pains. You can also help yourself sleep better but keeping the temperature cool at night. Most people sleep comfortably between 60 to 68°. Bedding made of natural fibers like linen and cotton have excellent breathability so you won’t get overheated, and they get softer with each washing. When your bedroom design includes features and elements that use light wisely, it enhances your ability to sleep. Whether you need to add blinds or change out your light bulbs, you’ll be happier knowing you’re making changes that will help you fall asleep faster and stay asleep longer. Bio: Samantha Kent is a researcher for SleepHelp.org. Her favorite writing topic is how getting enough sleep can improve your life. Currently residing in Boise, Idaho, she sleeps in a California King bed, often with a cat on her face. Bedroom designed by Designer Premier designer Joe. If you are researching ways to improve your sleep, then you have likely contemplated the best colors to Paint a Bedroom to improve your sleep. The color you select has an impact on the look of the space, but it also affects the way the room makes you feel. There are two primary color groups, cool and warm. 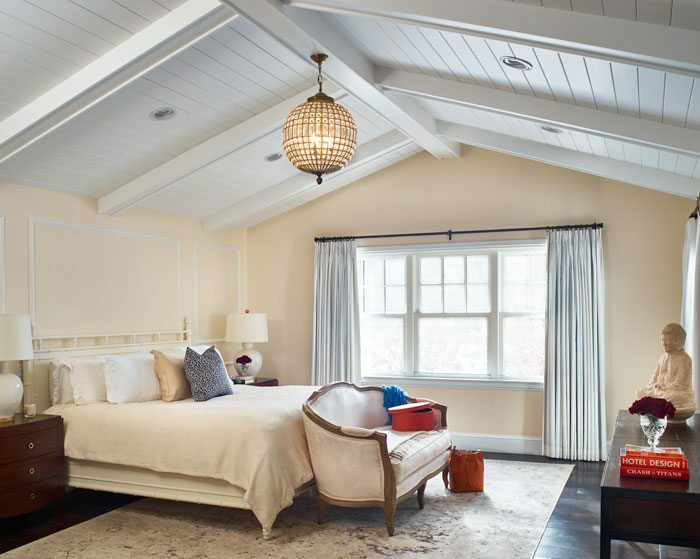 If you are thinking of building or remodeling, or need help refreshing your sleeping quarters, we can help connect you with the trustworthy professionals!